Wouldn’t it be great if everyone in the circumpolar region could understand each other without translators or interpreters? At least one linguist thinks that may have been the case about 20,000 years ago. Michael Fortescue, a linguist and expert in Eskimo–Aleut and Chukotko-Kamchatkan, believes that a group of people, all speaking a common language that he’s dubbed “Uralo-Siberian,” then lived by hunting, fishing and gathering in south-central Siberia (an area located roughly between the upper Yenisei river and Lake Baikal in today’s Russia, as shown in the map). 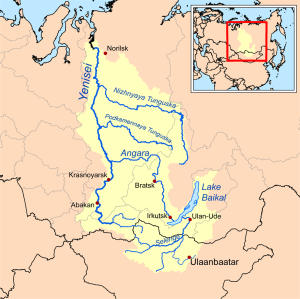 The area between the Yenisei River and Lake Baikal in central Siberia where early residents are thought to have spoken a common language called Uralo-Siberian that gave rise to Saami, Finnish and Inuit languages. thanks a lot for this interesting post. I’ve been noticing the same similarities between Finnish and Greenlandic and for many years I’ve been thinking about a possible relation between those languages. I’m a 32-year-old language teacher from Germany. I do speak Finnish fluently though cause I spent a year in Rovaniemi. I know a little Greenlandic since I taught English in Tasiilaq for 6 months, worked as guide in GL several times and I have been interested in Greenland and the Arctic since I was a young girl. I studied at Bishop’s University, QC, for a year, but unfortunately, I never had the chance to visit northern Canada. Really hope to go there one day. I was really happy to discover your blog and see all those lovely pictures as well as read all your fascinating stories. Thanks so much for sharing!